Amazon Elastic Compute Cloud (EC2) forms a central part of Amazon.com’s cloud-computing platform, Amazon Web Services (AWS), by allowing users to rent virtual computers on which to run their own computer applications. EC2 encourages scalable deployment of applications by providing a web service through which a user can boot an Amazon Machine Image (AMI) to configure a virtual machine, which Amazon calls an “instance”, containing any software desired. A user can create, launch, and terminate server-instances as needed, paying by the hour for active servers – hence the term “elastic”. 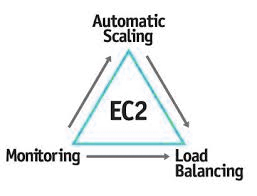 EC2 provides users with control over the geographical location of instances that allows for latency optimization and high levels of redundancy. Amazon EC2 Container Service (Amazon ECS) is a highly scalable, fast, container management service that makes it easy to run, stop, and manage Docker containers on a cluster of Amazon Elastic Compute Cloud (Amazon EC2) instances. Amazon ECS lets you launch and stop container-based applications with simple API calls, allows you to get the state of your cluster from a centralized service, and gives you access to many familiar Amazon EC2 features. Amazon ECS can be used to create a consistent deployment and build experience, manage and scale batch and Extract-Transform-Load (ETL) workloads, and build sophisticated application architectures on a micro services model. 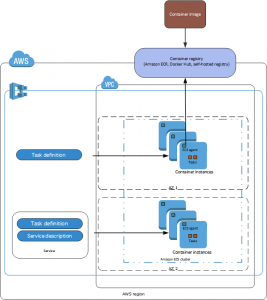 Amazon ECS is a regional service that simplifies running application containers in a highly available manner across multiple Availability Zones within a region. You can create Amazon ECS clusters within a new or existing VPC. After a cluster is up and running, you can define task definitions and services that specify which Docker container images to run across your clusters. Container images are stored in and pulled from container registries, which may exist within or outside of your AWS infrastructure. 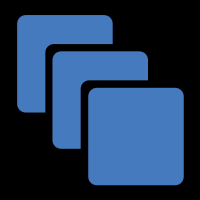 The console is a browser-based interface to manage Amazon ECS resources. For a tutorial that guides you through the console, see Getting Started with Amazon ECS. You can use the AWS command line tools to issue commands at your system’s command line to perform Amazon ECS and AWS tasks; this can be faster and more convenient than using the console. The command line tools are also useful for building scripts that perform AWS tasks. In addition to using the AWS CLI to access Amazon ECS resources, you can use the Amazon ECS CLI, which provides high-level commands to simplify creating, updating, and monitoring clusters and tasks from a local development environment using Docker Compose. For more information, see Using the Amazon ECS Command Line Interface. The Above mentioned is a Brief about the Amazon Elastic Compute Cloud. Watch this space for more updates on the Latest Trends in Technology.